camps Archives - Get Involved. Make Friends. Enjoy Motherhood. Summer Camps, Activities and More! Summer is just around the corner. Luckily, the Front Range is filled with fun for the whole family. From adventure camps to nature hikes to concerts in the square and movies in the park, this area is a haven for family-friendly frolicking. A minimum of 4 week commitment required (weeks do not need to be consecutive) Students provide their own healthy snack. 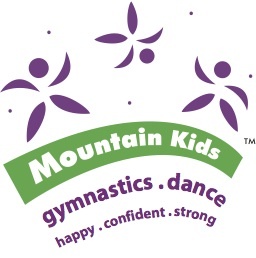 ***Mod Mom Members receive 15% discount on camp enrollment. Game On! Sports Camp 4 Girls – 10% off total summer camp registration for Mod Moms; Multi-sport summer day camp for girls 5-14; June 4 – July 13. Do you own a camp? Want to partner or sponsor with MOD Moms for your camp? Do you have a favorite camp or activity? Tell us about it. Chatauqua Meadow Music with Jeff & Paige (Fun family friendly hike followed by great nature-themed kid music. Monday evenings from 5:30-7pm. Meet by the Ranger Station for the short hike). Carousel of Happiness (Nederland) $1/ride! 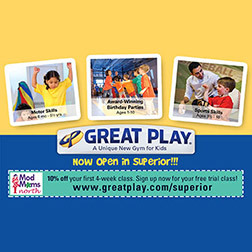 Great Play of Superior — (MOD Moms receive a 10% discount on enrollment and first set of classes) Spare your kiddos from a sunburn and fill up on active fun with Sanjana and her amazing team at Great Play. In addition to the always fun classes, Great Play is offering camp days for Juniors (ages 3-6) and Big Kids (ages 4.5 -10) as well as themed Camp Parties for both age groups as well! MOD Moms get a great discount, and the kids are sure to have loads of fun. The curriculum varies each week so each camp is fun and fresh! $35 each for non-members, $33 for members. 5-Pack Fun Pack: $150 for non-members, $140 for members. 10-Pack Fun Pack: $250 for non-members, $230 for members. Kumon of Boulder — (MOD Moms receive a 10% discount). Help your child get ahead with Kumon’s fun and engaging approach to reading and math! Students come to the center once or twice each week, and remain for approximately 30 minutes per subject. Daily assignments will be assigned for non-class days. For additional information, email the Center Director at john@boulderkumon.com. Our Summer Day Camp is full of action, fun field trips, sports & arts. Gymnastics is offered twice a week (on Wed/Fri Jr. Campers & Tues/Fri Sr. Campers). Campers will also get to choose to participate in either a 1hr Dance or Ninja Zone class on Mondays. Plus, tons field trips such as: Open Swim, Anderson Farms, WOW Children’s Museum, ABC Climbing, Sunflower Farms, IMAX, Tours and so much more! Weekly swimming lessons are provided for our Jr. Campers as an option under the direction of the Lafayette Recreation Center. We average 4 to 5 field trips a week. Campers are divided into Jr. Camp (entering kindergarten to entering 2nd Grade) & Sr. Camp (3rd Grade to 6th Grade) to facilitate age appropriate activities and social interaction. Our Jr. Campers stay close to home travel only within Boulder County and the nearby areas. Our Sr. Campers on occasion have the opportunity to travel to Denver to explore bigger and more age appropriate and challenging field trips to keep them engaged and having fun all summer long! Camp activities take place between 9.00am – 4:30pm. Children may come as early as 7:30 am and stay as late as 5:45 pm for no additional charge. Includes all activities and field trips for your convenience. Minimum enrollment of four weeks for the summer is required. Weeks do NOT need to be consecutive. Choose either full or part time tuition for each week of camp. We offer a 10% sibling discount! 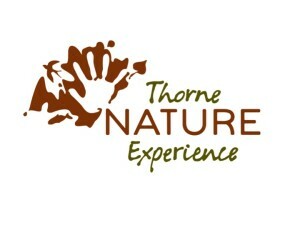 Thorne Nature Experience: (MOD Moms receive a 10% discount, enter code “MOD2016” upon checkout). Get outside! Your kids can spend the summer catching frogs, getting muddy, biking down mountain trails, and exploring Colorado’s wild places with the Thorne Nature Experience Summer Camp! Thorne offers fun, hands-on environmental “Camp Experiences” for children aged 3-15 in two stunning locations; Waterton Canyon in Littleton and in Boulder. Kids will have a blast practicing important survival skills, exploring forests and streams, learning about local plants and animals, and getting their hands on tadpoles, crawfish, grasshoppers, and more! Thorne’s experienced, CPR and first-aid trained instructors help facilitate student learning and appreciation for the outdoors while keeping them safe. Students complete the program with a newfound respect and awe of nature, increased understanding of the environment, and a desire to get back outside. Siblings/Students enrolled in multiple camps save up to $25.00 per camp! All camps are co-ed, unless otherwise specified. Child must be 6 years old, or have completed Kindergarten to enroll in school-age camps. All camps are co-ed, unless otherwise specified. All campers must be potty trained. Child must be actively enrolled in our Gym Stars Program to enroll in this camp. Superior Learning Academy Super-fun kid-centered preschool summer camp. (Through August 31st) Weekly themes like Robots, Bugs, Space adventures and Superheroes! Daily ($36/day) or weekly ($180 for 5 days), monthly or for the rest of the summer ($288 for two days a week, $432 for 3 days a week or everyday ($720 for 5 days). CHOOSE ANY DAY OF THE WEEK! WILD BEAR WORKS WITH YOUR SCHEDULE! Shuttle service is available from Boulder, pick up at 8:00 a.m. drop off in Boulder at 4:00 p.m. Choose any or all days of the week! NederRANGERS: 5 & 6 year olds (for the first time Wild Bear). Join other young friends to explore the forest, play, sing and make crafts with other campers with highly experienced Early Childhood Educators. This program includes trips to Mud Lake! Mountain Rangers – For the Wild Campers who are 6-7 years old The Mountain Rangers head out to Mud Lake to explore this magical place and integrate the arts into their discoveries. Wild Naturalists- For the Wild Campers who are 8-9 years old Venture out onto the surrounding Rocky Mountain forest, bring your camera and put on your water shoes to discover the water, the woods, and the mud. Try your hand at catch and release, camping and survival skills, and document the fun through creative lenses. NCAR Fridays For ages 5-8, children meet at the National Center for Atmospheric Research (NCAR) in Boulder EVERY Friday and enjoy nature workshops in and around the local foothills. DROP OFF: at 8:30 and PICK UP: at 3:30pm at the “drop off” at the NCAR parking lot. Children access the trails surrounding NCAR as well as the famous Mesa Lab with exhibits and scientists who will help us to connect even more with nature! Mountain Youth Adventure Program Summer Camps for ages 10 and older: Tuesdays, Wednesdays, and Thursdays in Nederland, Colorado. Includes Fly Fishing, Primitive Pathways and more! 10:30 a.m.-noon $15 per family (must be related). During the summer months, Bear Cubs is a parent/child workshop. 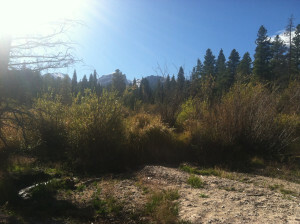 Meet at the Mud Lake parking lot every Wednesday and hike with us to the lake. Venture on trails, sing with us and discover the many plants and animals who live in and around Mud Lake. Pre-registration is required. *Child Care Assistance Program (CCAP) is accepted for payment at Wild Bear Mountain Ecology Center.